Baztab Emrooz, an Iranian news site close to Ayatollah Hashemi Rafsanjani, published parts of Rafsanjani’s memoire covering the last two days of the leader of the Islamic Revolution Ayatollah Ruhollah Khomeini. 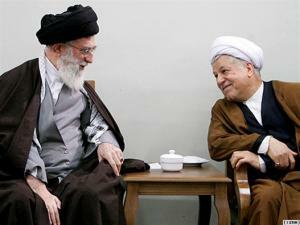 “Don’t let intriguers create conflicts between you and Khamenei,” Khomeini, lying in his deathbed, communicates to Rafsanjani. “I went to Imam’s Beit (the leader’s official residence). The doctors and people around him were satisfied (with Khomeini’s recovery). Ahmad Agha (Khomeini’s son) was worried. He wanted the work on amending the constitution be finished as soon as possible. To read Baztab’s article (in Farsi), please click here. Complete irrelevance in today's climate.The rotten edifice of the corrupt system of the theocracy and its zealotry have been fully exposed for what it is in the eyes of the Iranian people,and it's not a pretty picture to say the least.